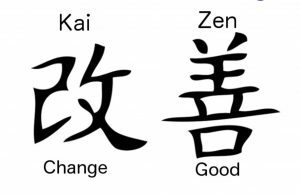 Kaizen is a Japanese word meaning “change, good”. It is the Japanese term for a gradual approach to ever higher standards in quality enhancement and waste reduction, through small but continual improvements involving everyone from the chief executive to the lowest level workers. Employees are the best source for improvement suggestions. They know where improvements can be made, but they need some like how and where to submit the improvement suggestions. And they need some guidance when they participate in the team to realize the improvement. The benefit is: it makes them proud and when participating they are engaged. When employees think and talk about possible improvements they have to understand what the customer expects and this creates more customer understanding and more customer focus. When employees think and talk about possible improvements they have to understand the business strategy and the objectives. Participating in an improvement team requires talents like communicating, analyzing, experimenting and collaboration. Things you don’t need during your normal job. By working together on improvements, the goal of your team becomes clear and the team understands better what the customer wants. By continuously realizing small improvements, the team develops into a top team.